Sarah brings 10+ years of experience in strategic public relations and integrated marketing to her role as Vice President at Cone where she works with clients in the food and agriculture industries. She specializes in consumer/brand marketing, along with reputation management centered around sustainability initiatives. 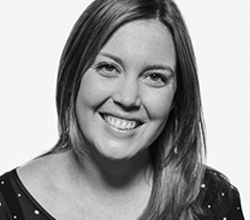 In her role, Sarah supports clients with strategic planning and program development, brand positioning and messaging, media and influencer strategy, and content marketing strategy. She has led the development and execution of integrated consumer marketing programs for multiple General Mills brands, Keurig Green Mountain, Wegmans, and mission-driven fast casual chain Zambrero (to name a few). In addition, Sarah leads proactive corporate sustainability communications for the Almond Board of California and a global communications program tied to agriculture supply chains for the Fair Labor Association, in partnership with the U.S. Department of Labor and Nestlé. Sarah received her B.S. in Textiles, Fashion Merchandising and Design from the University of Rhode Island and a Master of Liberal Arts in Gastronomy (food studies) from Boston University. Her graduate study focused on food and agriculture marketing and sustainable food systems. Sarah also serves on the marketing committee for the Dorchester Food Co-op in Boston.